From early childhood, we are taught the magic words: thank you. I don’t have to tell you that these two simple words can make or break the relationship between an organization and its donors. Most nonprofits know how important it is to send acknowledgment letters after receiving gifts. We dutifully thank our donors for the recorded gift date and amount and tell the donor about the many great works we perform because of the gifts we receive. Some of us even add the executive director’s signature as a personal touch. We thank our donors and move on to the next task. But, to truly engage and retain donors, we need to do so much more! 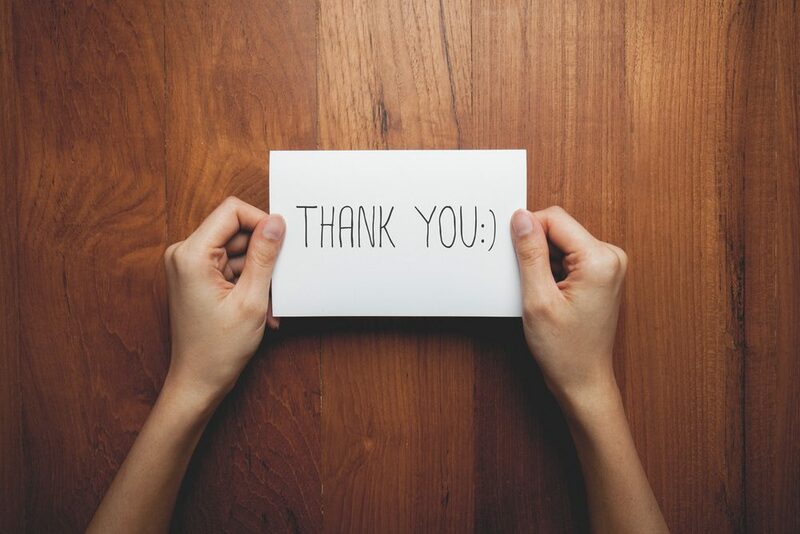 We need to foster an attitude of gratitude and create a culture of “thanks-4-giving!” Developing a donor-centric gift acknowledgment policy is key to ensuring our donors feel appreciated and our board members are excited about fundraising – which is a win-win for any organization! Who is involved in each step of the thank you process? Invite board members into the thank you process. Thank them first and recognize their gifts and role as huge supporters of your organization. Print a weekly gift report that’s given to every staff and board member involved in thanking donors. Brainstorm ways to make sure EVERY donor knows their gift matters. Prepare thank you note cards at board meetings with notes about the donor. Also, ask board members to write, or at least sign, several notes OR better yet, make phone calls, thanking the donors before the meeting officially begins. Is it part of a larger, more encompassing thank you policy? What happens from the moment the gift arrives? Do you have this policy in writing so that it is an organizational process, not person dependent? Does the gift amount determine the speed of acknowledgment, who the ‘thanker’ is, or the method of thanking? How often are acknowledgment letters sent? Is it a daily, weekly, or monthly task? Are larger donors thanked more quickly than smaller donors? Is a $10,000 gift acknowledged the same way as a $10 gift? Is a donor thanked at any time besides in the gift acknowledgment letter or the next ask? EVERYWHERE! Every time we see them. Every chance we get. Expose staff members to donors’ names. Post a donor sign/wall in the office. Acknowledge them in a weekly employee briefing or at a staff meeting. Mention donors on the website, in newsletters, and on social media. Get the word out: you have FANTASTIC donors! Why do we always need to thank donors? Isn’t once enough? Because without them, nothing happens! Your organization is the facilitator of the relationship between the donor and the recipient. Try not to get in the way. Focus on how the donor makes a difference. Decide 3-4 extra “thanks-4-giving” times per year. From Valentine’s Day to your organization’s anniversary to the donor’s birthday, there’s lots of opportunities to show your gratitude. Produce a quick-and-easy thanks video that highlights program participants and send it out via email. Hold an annual “thanks-4-giving” breakfast, picnic, or other event. Post a daily/weekly/monthly (depending on the volume of donors) social media “shout-out” that highlights specific donors. John F. Kennedy once said, “As we express our gratitude, we must never forget that the highest appreciation is not to utter words, but to live by them.” As nonprofits, we must follow this advice and live our gratitude for the donors who make our work possible. From social media posts to regular phone calls and appreciation events, taking a “thanks-4-giving” approach will help our organizations not just survive, but thrive, in the future.